One of my favorite movies has long been the Joel Schumacher directed Falling Down. The reason I bring this up now is because that film clearly adheres to some… well, the kind word would be “conventions”. Most notable of these is the concept of the good cop who is about to retire, yet gets involved in one more life-or-death cat-and-mouse game with a dangerous villain. Merely having this sort of trope the layer the rest of the plot over does not detract from the film, however, anymore than knowing that a time machine will be used at some point in the movie detracts from Back to the Future. The reason is that the rest of the film provides a lush characterization of its twin protagonists, and this helps them rise above their signifiers. I don’t know that The Negotiator, directed by F. Gary Gray (Friday), really wrings as much humanity out of its characters as it might have been able to, but it does create it atmosphere from the things that its characters don’t say or do just as much as from gunfire and yelling exchanges between angry police officers. It begins by introducing the viewer to Danny Roman (Samuel L. Jackson), a cocky police negotiator who can talk the roughest, nerve-jangling criminals down from the ledge, or at least get them to place where they can be taken out by snipers. Immediately after jeopardizing a girl’s life by entering the crime scene against orders, Roman is being celebrated for his quick-thinking, pulse-pounding bravado rather than reprimanded for his reckless decision. A friend calls Roman out to the parking lot, where the two discuss a conspiracy involving the police officers’ pension fund being looted of millions of dollars – oh, so that’s happening too? Roman’s buddy indicates that Internal Affairs may be in on the conspiracy, and doesn’t get a lot more to say after that because Walter White’s brother-in-law interrupts the conversation and we Jackson’s friend is never heard from again, if you catch my he was murdered. It is at this point that the blame seems to fall on Roman’s shoulders and it seems that he will be imprisoned for a crime he did not commit. There’s only one thing to do: hold four people hostage in the upper floors of a skyscraper. This is where the negotiating comes in. Because Roman knows the tricks of the trade, he successfully blocks all options the police have for getting eyes or ears into the building, but he asks for a hostage negotiator from another precinct to be his point of contact with the outside. The man is Chris Sabian (Kevin Spacey), and it is in the foil of these two powerhouse actors that the sparks really begin to fly. Roman wants to know why he’s been set up and has cause to believe that one of his hostages may have knowledge about this; since Sabian is from a different precinct, his objectivity is necessary… anybody in Roman’s team could be behind the conspiracy to frame him. But Sabian makes it clear that his goal is first and foremost to bring the stand-off to a nonviolent conclusion. There’s no tension in whether or not Roman will kill his captives because we’re reasonably certain that he’s not a killer – although wouldn’t it have been amazing if he had been responsible all along? Regardless, the real tension is in whether Roman will be able to discover the secrets of his oppression in time, and whether he will be able to convince Sabian of his innocence. Both men know how to play the game. They know the rules of engagement, and are confident in the way that they handle each other. There’s a thin line between a bluff and total sincerity; both capable negotiators are trying to read each other in their interactions. I’ve read that Spacey was originally cast in Jackson’s role, but I think the reversal was a wise move. Spacey’s deadpan intensity works wonders in his quick-thinking decisions on how to counter Roman’s attempts at controlling the situation. Jackson’s commanding presence is much more attuned to the requirements of the character, making him powerful and menacing without over-acting or reaching toward the absurd. The changing dynamics of the group of hostages in the room, which surprised me by including J.T. Walsh, Paul Giamatti, and Siobhan “Eggar your skin is hangin’ off your bones” Fallon, for the most part worked well. The transition in the hostages’ reaction to the situation they’ve found themselves in is well-handled, even if it is somewhat unbelievable. Walsh in particular, in this his last film role, says very little yet remains a charged presence on the screen. His silent, sneering looks at Jackson and occasional slips of knowledge keep the audience guessing as to the level of his involvement in the conspiracy afoot. Yes, there are action scenes. Yes, there are shootouts and bomb explosions and shattered glass and a raging fire. 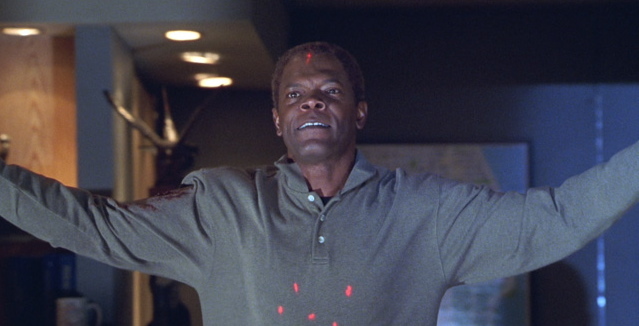 In what is probably the most famous scene in the film, Jackson stands in the void of a destroyed window, offering snipers in a helicopter the opportunity to shoot him. But despite the inclusion of these loud, brash sequences, the strength of the film is in those which are much more contained. Among the greatest moments in the film comes when Sabian has a man come in to bluff knowledge of the conspiracy, a ruse which Roman quickly uncovers and which infuriates his wife. She curses Sabian, telling him to leave her out of any further attempts to trick her husband. “The bluff wasn’t just for him,” the negotiator whispers, putting a new spin on the scene which had come just prior. Was there anybody whose eyes moved the wrong way, whose lips trembled, who gave off any of the innumerable tell-tale signs of lying? So even if people do get fired upon – it’s an action movie, after all – the resolution comes more from saying the right things and not firing the right shots. With that said, I think the movie could have embraced this decision more readily. The exchanges that Jackson and Spacey share, though intriguing, are also brief. There’s not really long stretches where the two talk on the phone, battling wits back and forth in the taut manner that might have been. The rest of the police force is eager to get in and get the carnage started, which I understand is useful as an artificial “race against the clock” but detrimental to the cause of the two performers working with one another. Every short exchange that the Roman and Sabian share is punctuated by the rest of the police force closing in ever more. For pure excitment’s sake, this works, but it feels lazy. Anybody can move pawns closer and closer to a central location – there’s no skill in a sudden explosion of action. What’s more involving is the slow realization on Sabian’s part that the hostage-taker may be right. As it stands, this does work in spite of some of the otherwise cliched plot points, so that a callback at the climax feels smooth and organic, but I can’t stop thinking about the The Negotiator that might have been: one which places more emphasis on the act of negotiation. I like this film and can watch it over & over.